I've read a few essays, a whole collection of short stories plus a couple others, and a fraction of one novel. So I'm an expert now. I thought there might be some clever way to encapsulate his style, to call him someone's literary descendant. Some part of my mind even suggested to me Patrick Hamilton — there's a certain breathlessness, an inevitable accompaniment to the attempt to follow and explicate the dark and wondrous workings of the human mind. If he is anyone's "descendant" — in the tradition of those examining the psychology of minutiae, what constitutes the banal — he is so via Calvino, tracing a precise mathematical function of action and reaction. The stories in Oblivion were somewhat darker than I'd expected. Though I don't really know what I expected. There's death and suicide, grim circumstances. Nasty thoughts. Pettiness. A couple things in particular strike me. In one story it's explicitly stated that life happens in our peripheral vision. And I think he's right. The point of things is sometimes brought into sharp relief against things we can barely make out, but most of life is a blur, a mash; if there is a point, it ripples through the mire as we shift our attention. The other thing is the quick cuts. In some stories we switch story lines by the paragraph. Elsewhere the shifts happen one clipped sentence after another, within the same breath even. This confused me at first, but I came to understand it as the parallel unfolding of simultaneous thoughts, memories, events. We are film-literate enough to understand it if it occurs on screen; but our habits of how to read a page are more ingrained, harder to remould. I liked the stories better than I liked the bit of novel I've read to date, and I like the essays better than the stories. Keen observation, of which David Foster Wallace is a master, outshines vivid imagination. This thing about the periphery — I think real life is richer in senseless detail than fiction could ever be. Helena tells me one of the boys in her class is really good at matiques. I don't understand. "You know, matiques... Et matiques. I finally put 2 and 2 together: mathématiques. This afternoon, 2010 is on TV. We watch some, and struggle to make sense of it. Helena starts chess club this week. We must retrieve the knights from the Lego ramparts. Rainer Maria Rilke and Louise Andreas-Salomé shared a love story, or something like it. My day also wishes me to tell you: it is poor because you are not near it; it is rich because your goodness spreads light over all its things. I talk to you often and speak of you with all that is mine. Live, sad to say, among people who interrupt my dreams with their loudness, and know, of course, not a single one of them. They are people who talk about trips, rainy days, and raising children, who bow deeply to each other, smiling and rubbing their hands, and greet each other with "Good Morning" ten times a day in loud, disagreeable voices." And so I associate only with Stauffer-Bern, who, though unpleasant in many respects, still seems an interesting and remarkable man. I look forward to telling you about this strange Bernbeurger, who is a mixture of daring and cowardice, of quiet, pellucid feeling and brutal, callous assertion, and who seems to express these inner contradictions (always magnifying them awkwardly) whenever he is in the presence of a woman. But the real tragedy of Stauffer's life lies not in the self-doubt that again and again subjects his hope to bitterness and leads him away from one branch of art off toward some other, before he can ever really flourish in any one: but rather in the fact that neither he nor Frau Escher recognized early enough (or wished to recognize?) what really attracted them to each other; and that then, when such recognition did belatedly arrive, in the sacred day of their having at last found each other, such violent storms erupted that all the young sprouting seeds could not but be destroyed. It is not enough for two people to find each other, it is also very important that they find each other at the right moment and hold deep, quiet festivals in which their desires merge so that they can fight as one against storms. How many people have parted ways because they did not find the time slowly to grow close to each other? Before two people can experience unhappiness together, they have to have been blissful together and possess a sacred memory of that time, which evokes a kindred smile on their lips and a kindred longing in their souls. They become like children who have lived through the festivities of a Christmas night together; when they find a few minutes to catch their breath during the pale, drawn-out days, they will sit down together and tell each other with glowing cheeks about that pin-tree-scented nighttime full of sparkling lights . . . Such people will weather all storms together. — Rainer Maria Rilke to Lou Andreas-Salomé, September 5, 1897, from Rilke and Andreas-Salomé: A Love Story in Letters. This is a remarkable book. I've read it slowly, very slowly, over months, which I think is the only way, really. It's been my summer book, from first flush to cool comfort. This summer has been bracketed — set off from the rest of my life — between its covers. And it is a love story, or so the subtitle claims. The love is difficult to disentangle sometimes from the writer's block, the writer's despair, the treatises on art, the plans, the endless plans for visits, travels, studies, work, plans many of which never came to fruition. They are each of them in love with their work, but their love for each other remains something of a mystery. The first of the letters is from Rilke, following their first meeting, an afternoon tea with a mutual friend, in 1897. They became lovers shortly thereafter, and spent a good part of the next couple years together, though this I learn from the notes, the exact nature of their relationship being rather difficult to discern from the letters themselves. 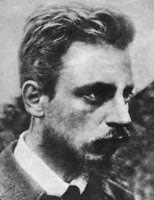 Their correspondence continued until Rilke's death in 1926. Rilke's letters are at times effusive and nostalgic for the the time they spent together. Above all, they are poetic. Even while he despairs of not being able to produce anything worthwhile of his own, he grasps for life — passionately — in the work of Rodin and Baudelaire. He is excited to discover, and share, Proust and Rabindranath Tagore. Later, he is a fervent admirer of, and feels a deep affinity for, the poetry of Paul Valéry and throws himself into the task of its translation. One of the most interesting letters, one which excites discussion throughout the ensuing exchanges, concerns Rilke's impressions of Rodin — both the sculptor-artist and the person. Rodin is clearly not just an artist, but a craftsman, as well as being of a disposition that includes the focus and discipline that his art-craft demands; these are characteristics Rilke strives for (virtually to the end of his days), but it's apparent that his chosen medium — words — doesn't allow for the same tangibility of effect. Nothing he chooses to sculpt has for him even the slightest hint of vagueness: it is a region where thousands of tiny surface elements have been fitted into space, and his task, when he creates an artwork after it, is to fit the thing even more tightly, even more passionately, a thousand times more adroitly than before, into the breadth of space around it — so that it wouldn't move even if one shook it. The thing is definite; the art-thing must be more definite; removed from all accident, torn away from every uncertainty, lifted out of time and given to space, it has become enduring, capable of eternity. The model seems, the art-thing is. Thus the latter is that inexpressible advance over the former, the calm and mounting realization for the desire to be that emanates from everything in nature. By this is banished that error which would view art as the vainest and most capricious of vocations; art is the humblest service and founded absolutely on law. But all artists and all the arts are infected by this error, and so a very powerful man had to rise up against it; and he had to be someone whose pronouncements are deeds, someone who doesn't talk and incessantly creates things. From the beginning art for Rodin was realization (and such the very opposite of music, which transforms the seeming realities of the everyday world, and de-realized them even further by absorbing them into the easy glissando of appearances. Which is why this opposite of the art-work, this vague act of non-condensing, this temptation toward diffuseness, has so many friends and advocates and addicts, so many who are unfree, who are chained to pleasure, who have no inner powers of intensification and must be enraptured from without. . . .). As entrancing as the words and ideas are, let us not forget that Rilke writes all this to one woman in particular (though it is easy to forget — a great portion of Andreas-Salomé's letters did not survive). The big question: Who is this woman who could so engage the bright minds of Europe? It's rumored Nietzsche proposed to her (though biographers dispute this). Though married, she seemed to have enjoyed intense correspondences and relationships with many intellectuals, Freud also among them. And I am looking forward more than words can say to my rooms and woods; to the wanderings and exploratory side-trips one undertakes so deep within oneself while trees, tiny animals, clouds, mountaintops look on in silent sympathy. It is almost divinely beautiful that life knows and can embrace this alternation from the outside to the inside and vice versa. Often, often, often I am with you in all my thoughts and discover there again and again such fullness, which I ever so gradually relive, since in the actual moment of our being together there was not nearly enough time to experience it. — Lou Andreas-Salomé to Rainer Maria Rilke, October 28, 1913, from Rilke and Andreas-Salomé: A Love Story in Letters. Not quite 3 weeks into kindergarten, and I hear what's sure to become a familiar drone for years to come. "I'm tired. I don't want to go to school today." We make some final wardrobe adjustments, and Helena's attitude relaxes a little before she puts on another. But they'll probably have a détente she tells me, as she stretches out on her rumpled bed, assuming a pose of repose. "Une détente! C'est plus cool qu'une sieste." She raises a cocky little eyebrow. "Mais, oui! C'est pas la garderie; I'm in school now." — from "Mister Squishy," in Oblivion, by David Foster Wallace. So. I managed only to read a mere fraction of that brick he wrote, kind of hating it while admiring it, resenting it for not quite getting it, but had (still have) every intention of reading the whole damn thing before the year is out, chalking up my relationship with that book as a matter of wrong time, wrong place, and choosing to reserve judgement for after a better time and place could be had with it, and it sits uncomfortably with me to pay attention to the man's work just because he's gone and died, but I loved (loved!) that commencement address of his, and I pressed it upon tens of people who didn't know who the hell he was (and most of them were in agreement with me in finding it a pretty beautiful thing), and that lobster essay was pretty interesting too, so I found it unsettling but serendipitous that on my lunch break yesterday, on a quick jaunt over to the bookstore across the street, I should find Oblivion in the bargain stacks, so I bought it, even while I wanted to chastise the checkout clerk (on whose face there was no sign of recognition of the book, or the author's name, no sign that the material substance of our transaction had registered in any way other than that of the electronic scanning of barcode and resulting financial exchange), or the management, that this was somehow wrong, wanted to wake them up, "Don't you know he just killed himself? And you put him in the bargain stacks?" just as similarly, but different, when I found Doris Lessing on that same table I wondered, "Don't you know she was just awarded the Nobel prize?" but hey, the guy's dead, and the book was cheap, why not read it now? I managed to read a story (at random, from the middle) while waiting in line and found it, well, devastating. "I spy, with my little eye, something that starts with the letter A," Helena challenges me while we lunch. None of the usual possibilities are in evidence. She's been trying new things lately, but I draw a blank. Finally I ask an all-important question: "Starts with A... In English or in French?" "English. En français, ça commence avec Z." She's quite clear on this. English, A; français, Z.
I need a hint. "Everybody has two of them." Arms? No. "They can be blue, or green, or..." I throw out random silly answers: feet, parents, eyes, cars. She smiles as if I've hit on something. "A-, aaa-, a-, eyes." Oh. But the French doesn't fit? "Z-, zzz-, z-, zyeux. Lay zyeux. Les yeux." It's clear we have a way to go in our spelling skills. In both languages. [O]ne lacks the innocence to be with Nature; her influence, her quiet insistent presence, is outweighed from the start by one's awareness of the nameless human doom that is grinding on day and night, unstoppably. — Rainer Maria Rilke to Lou Andreas-Salomé, September 9, 1914, from Rilke and Andreas-Salomé: A Love Story in Letters. I'd been in an unreasonably good mood as the week started, but very suddenly it turned. 1. I think I may have killed Slimey. Too much water. 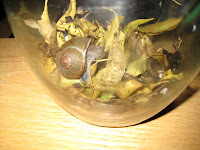 I cleaned out his jar, leaving him there to dry out, but when I told J-F I thought he might be dead, J-F at once removed the jar from the house. I think now I'm more upset at the prospect of not knowing whether he lives or dies than by his potential death in itself. I was holding out hope that Slimey would right himself — surely he's simply tired from having gone to school with Helena. 2. I've been anticipating review copies of a couple books this week and still I haven't received them. Grr. 3. I did not manage to attend the cello Master's Recital yesterday evening as I'd planned. I've been thinking of it for weeks, but felt guilty and selfish for already having spent an evening out early in the week and with another commitment another day soon, and resentful that I must cook supper and bathe the child and see said child to bed and spend time at home. This, entirely irrational. Of course, I could've gone, and we fought, and suddenly it was easy to go, there was time for this, for that, and for me too, and I almost went, but in the end I chose not to. There will be more recitals in weeks to come, and I will plan better. It's taken very little to set things right again. 1. I drop Helena off at school in the morning. I've developed an interest in befriending one of the other mothers — this based solely on the fact that she wears exquisite shoes. 3. I've started learning tai chi. It makes my fingers hurt. I don't think this is normal, but I like to think this is what it must feel like when negative energy leaves my body. 2. Swung on a swing at the park. 4. Made crêpes. With the kid. Lots of them. (Lots of crêpes, just the one kid.) We will have no breakfast worries for weeks to come! 6. Fed the ducks at the park. (The other park — took the métro.) Instigated some kind of duck riot. 7. Got caught in the rain. Got soaked. Jumped in puddle. 9. Stayed in our pyjamas all day long. 11. Made significant headway in the book I'm reading — have been reading all summer (Rilke and Andreas-Salomé: A Love Story in Letters). 13. Watched some favourite Doctor Who episodes. Helena has seen them numerous times, but she asks more sophisticated questions about them now. 15. Did I mention? Stayed in our pyjamas all day long. There's something joyous about Adverbs, by Daniel Handler. It's not the what; it's the how. It's executed playfully and brashly, if sometimes wistfully. I'm not sure what qualifies it as a novel, why it proclaims itself to be one. It reads like a series of interconnected short stories, with some characters recurring and some incidents in common. But it's all about love. Each of the stories takes for its title an adverb — briefly, symbolically, particularly — the manner of love explored within it. I am trying to figure out the difference between this book and the other collection of short stories I recently read. The stories in One More Year (Sana Krasikov) were also about love, various kinds, but all imbued with loneliness and desperation. Adverbs, on the other hand, while it doesn't shy away from the odd or hopeless, glories in all love's messiness. These 2 books — only the words are different. Am I in a better mood this week? I have been busier and am more tired. Does this make me more or less in the world? Does that put me more fully, better, into the experience of reading? The joy — does it come from me or the book? Here's a question Handler poses that I'm stuck on: When do you know when something is becoming something that changes you? That would be pretty much everything, all the time, if you're open to it. When do you learn that the world, like any diner worth its salt, is open twenty-four hours a day? Because it is, you know. I learned this some time ago, but it's important to be reminded. I've been reading this book mostly in the metro, a diversion from the general misery of the commute(rs). They abandon the clearing for the rest of the story to walk together. This is how it is in life and love. In life and love we are with people for a while, and then we join other people, people we have not met, and we walk with them, and we leave behind all the things where we used to be. Sometimes we leave people behind too. Sometimes we walk away from the forest and abandon a person there and never see them again. This happens every day. Every day this happens and scarcely anybody cares. Handler tells us on virtually every page what love is, how this is part of it, and this too, and this thing also is a kind of love, and he's right, really, everything — all of it — is love. It's weird and sad, but this is life. Grab it by the balls. Be in it. Love! Wired pulls back the curtain on creating a feature (and on Charlie Kaufman, it so happens), blogging the entire process: Storyboard. The editor in me thinks this is one of the very coolest concept blogs ever! — from "The Worm," in Romantic Dogs, by Roberto Bolaño.